This article covers stock transfers across locations within Stock&Buy. The stock transfer functionality goes hand in hand with the multi-location inventory support in Stock&Buy. The Stock transfer page helps you move inventory from one location (the source) to another (the destination). The Transfer from location is the source of the inventory transfer. The Receiving location is the destination location for the transfer. At this stage, the stock transfer is a draft state and has no impact on your stock levels. Click Receive to execute the transfer and move the selected products from the source location to their new destination. Although not necessary, we highly recommend you enter a comment into the transfer page to describe the reason of the inventory movement. 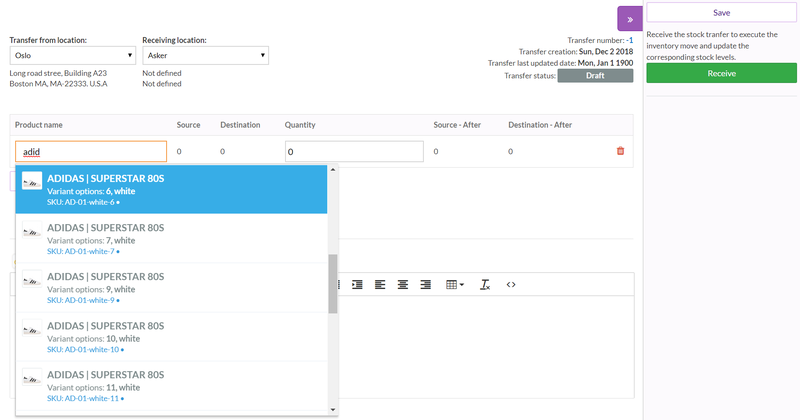 Another way to transfer stock between locations is to edit the product quantities directly from the product details page. This feature is suitable for transferring your products, one at a time. This operation will result in two adjustments. The first one removes stock from your source location, the second adjustment adds the stock to the destination location.